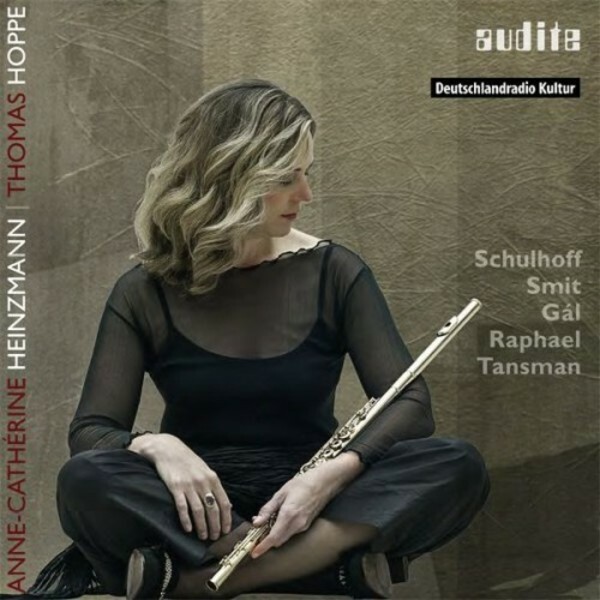 With this CD, Audite presents its second duo production with Anne-Cathérine Heinzmann and Thomas Hoppe. It contains sonatinas and suites by five 20th-century composers. In their respective aesthetics, each composer shares the ability to use forms and models of music history as inspiration for his own modern musical language. Existentially, they shared a common fate: all were persecuted by the National Socialists. Some were murdered in concentration camps and others fled to continue their lives in exile. Leo Smit, Alexandre Tansman and Erwin Schulhoff were inspired by French music, including Claude Debussy’s sense for melodic elaboration and the openness towards jazz shown by the Parisian musical scene. For Günter Raphael, classical clarity and romantic differentiation were decisive ideals; in his late 'Intermezzi', Hans Gál looked back at his artistic origins in the circle surrounding Johannes Brahms. These five intensive, virtuoso works shed light on facets of an age to which attention is rarely paid.